Penn College’s exciting two- and four-year majors were on display throughout the Pennsylvania Farm Show in Harrisburg (Jan. 10-17), where representatives of the Admissions Office and the college’s six academic schools entertained, educated – and even fed – the throng attending the traditional agricultural expo. Penn College offers something to enjoy in all seasons, but takes on a particularly pleasant air as winter approaches. Several inches of snow fell across the area overnight, prompting a two-hour delay Thursday morning and offering a glacial glimpse at what’s ahead. The Centennial Legacy Celebration, recognizing the donors who help further Penn College’s mission – and showcasing the talented students in the School of Business & Hospitality – was held Saturday evening in the Hager Lifelong Education Center. Invited guests enjoyed dinner in Le Jeune Chef Restaurant, bookended by appetizers and a Grand Pastry Buffet in the Keystone Dining Room. The phenomenal success of the Centennial-related Penn College Scholarship Campaign was noted by President Davie Jane Gilmour, who said more than $6.1 million has already been pledged … and more gifts are expected before a final total is announced in mid-January. “This additional scholarship support will help the college pursue its vision of being a national leader in applied technology education,” she told donors, “and it was only made possible thanks to your generous support and commitment to Penn College. The impact of your generosity is already being felt by students, as the (Penn College) Foundation has awarded more than $600,000 in scholarships this academic year – a 150-percent increase from the start of the campaign!” Support came from many members of the college community, who donated to an existing scholarship or established one of the 71 new funds added over the past three and a half years. The broad-based demonstration of support involved 653 alumni, 439 employees and retirees, 598 friends of the college and 197 industry partners. A variety of Penn College student organizations and departments have put their best wishes forward in oversized holiday cards, installed by General Services on the campus mall Nov. 25. Colorfully conveying messages that range from faith to frivolity, from Centennial to solemnity, the cards were lighted at 5 p.m. Wednesday on the Breuder Advanced Technology and Health Sciences Center patio. A total of 486 voters from the college community chose their favorites via an online ballot; the top three selections in student and employee categories (as noted below) were announced at the traditional ceremony. Four students in the School of Industrial, Computing & Engineering Technologies have each been awarded $2,500 scholarships from the Gene Haas Foundation, furthering the generous benefactor’s longtime partnership with Pennsylvania College of Technology. Scholarship recipients are automated manufacturing technology majors Austin R. Ayars, of Nazareth, and Austin R. Schaeffer, of Oley; and machine tool technology students Dakota J. Endress, of Josephine; and Samuel N. Schwyter, of Williamsport. Penn College has a long-term relationship with Haas Automation Inc. and its distributor, Haas Factory Outlet (a division of Lance Co. in Bensalem), and a portion of College Avenue Labs is designated as a Haas Technical Education Center. On this Veterans Day, PCToday salutes the Pennsylvania College of Technology students, faculty, staff and alumni who have served (or continue to serve) their country. Members of the campus community are encouraged to say “Thank you” for the military service of their colleagues, recognized through this voluntary honor roll. Penn College welcomed prospective students, their families and friends, and its community neighbors to Fall Open House on Sunday. Helpful employees, students and alumni were on hand throughout the day to enable exploration of academic programs, student life, and the college’s campuses and facilities. The student-focused portion of the day was held from 9 a.m.-3 p.m.; free transportation was provided to and from the Schneebeli Earth Science Center near Allenwood and the Lumley Aviation Center in Montoursville. A Community Centennial Event, inviting the public to help celebrate 100 years of adult education, was from 2-4 p.m.
Information technology majors from Pennsylvania College of Technology proved their prowess at a recent cybersecurity competition. A five-member Penn College contingent finished second at the Altamira Hackathon in Fairfax, Virginia. Conducted at George Mason University, the competition required participants to test their skills around the Atari game Scram. Team members controlled various aspects of a nuclear reactor while protecting their computer network and attacking the computing resources of other teams. 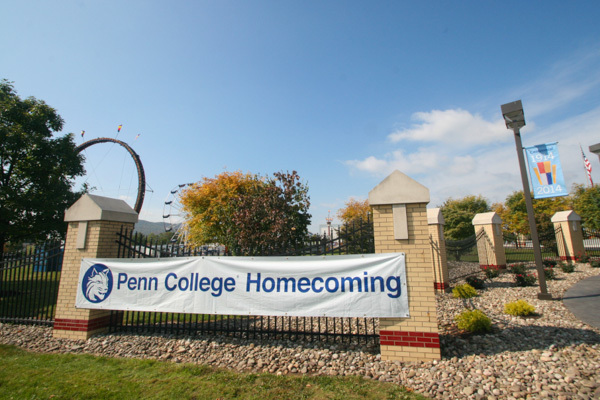 Homecoming 2014, a spectacular continuation of Pennsylvania College of Technology’s Centennial celebration, made institutional history while honoring it. Marked by the first-ever campus carnival, the inaugural reunion for Williamsport Area Community College alumni and employees, and an Oktoberfest, “Then … Now … Forever Proud” offered nearly a full week of activities that can’t even fit into an online gallery of more than 140 photos. More images from the week’s activities – which included a faculty lecture, a gallery opening, dedication of a conversation-starting art installation, several other get-togethers and the latest Athletic Hall of Fame induction – are available via Penn College Alumni Relations on Facebook. As part of its Centennial anniversary, Pennsylvania College of Technology welcomed 78 new “students” this fall, many of which just might be around for the institution’s bicentennial. Some of these “freshmen” could sustain a broken body part, and others might corrode. But if welding majors, faculty and staff did their job correctly, the “Student Bodies” Centennial Sculpture will be still standing in 2114. Augmenting the campus mall, the large-scale project features 78 abstract human forms made of scrap-metal pieces welded together. 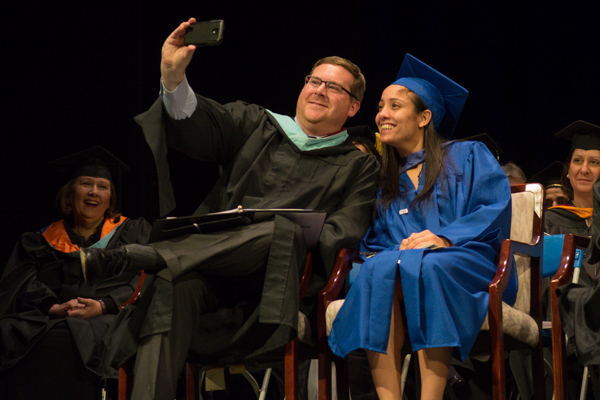 The college formally dedicated “Student Bodies” today during homecoming festivities. It’s the third recent art installation meant to enrich the college’s outdoor environment. Penn State President Eric J. Barron traveled to Pennsylvania College of Technology on Tuesday, his first visit since assuming the presidency in May. In a timely trip to a main campus observing its 25th anniversary as a special mission affiliate of Penn State – as well as its yearlong Centennial celebration – Barron met with students, viewed three recent art installations, toured Madigan Library and student housing, explored the college’s role in the natural gas industry, and visited a variety of instructional labs. Joining Barron and his wife, Molly, on the tour were Penn College President Davie Jane Gilmour; retired Penn College Board of Directors Chairman Robert E. Dunham and his wife, Maureen; Paul L. Starkey, vice president for academic affairs and provost; and police Chief Chris E. Miller. A reception in the Victorian House and dinner at Le Jeune Chef Restaurant, where the group was joined by state Sen. Gene Yaw, board chairman, followed. The third time for Wildcat Comic Con went beyond charming into the realm of enchantment, as presenters and the public bonded over graphic novels, cosplay, gaming and other common interests. The event, held across Pennsylvania College of Technology’s main campus on a gorgeous fall Saturday, put a unique educational spin on popular culture – and left hundreds upon hundreds of attendees already anticipating a fourth installment. The third large-scale art installation created to celebrate Pennsylvania College of Technology’s Centennial has woven together not only text and trees, but students from across campus. Over two weeks, more than 160 students from various majors participated in the creation of “These Trees,” an art piece utilizing a variety of tree species harvested from Penn College’s Schneebeli Earth Science Center and installed on the west lawn of the Bush Campus Center at the college’s main campus in Williamsport. Pennsylvania College of Technology’s three-day Parent & Family Weekend, in which hundreds of participants joined with their favorite students to help celebrate the institution’s Centennial, offered a packed calendar of activities that included informal access to the president and senior administration, entertainment, food, games, tours and a popular “mocktail” competition.